If you like the sun and the sea of the South Mediterranean shores, believe me, you will love my apartment at Erchie on the Amalfi Coast. Built on rocky slopes, some 30 meters high above the beach, its views on the sea and the tiny village of Erchie below are impressive. The apartment has its own private GARAGE and it's new, comfortable, with elegant modern furniture, very light, sunny with a balcony facing the sea. Featuring two bedrooms on different floors with comfortable king-size double beds, separate toilette for the bedroom upstairs, open space sitting room, modern kitchen with all appliances, bathroom with tub, shower, bidet, independent central heating, air conditioning, free Wi-Fi (from May to October). For optional use of heating and air conditioning you should consider an extra charge of 45 euro per week. My name is Luigi Di Bianco and I was born 64 years ago in Erchie on the Amalfi Coast. I went away from the village at age 19. Retiring, I settled in a village of South Tyrol in the Dolomites area. In 2002, I inherited Casa Rosalia from my father. In subsequent years, I completely renovated the house in order to use it as my family holiday home. The house is now used primarily for the holidays by the sea of my family ... and for the holidays of the lucky few travelers that are able to find it available. The Amalfi Coast is a place unique in the world for the beauty of the landscape, for its excellent cuisine and the sites of historical and cultural interest. A visit to the Amalfi Coast at least once in a lifetime is a must. I had the good fortune to be born and grow up in Erchie, a small town on the coast. I inherited Casa Rosalia from my father. I completely restored it in 2003 just to use it as my family holiday home. Unfortunately I cannot stay long in Erchie and this is why you were so lucky to find Casa Rosalia available for your holiday on the Amalfi Coast. The really unique feature of Casa Rosalia is the view from the balcony. When for the first time you go out on the balcony you really want to exclaim 'wooooowwwww' ... if you do not suffer from vertigo. Lovely apartment, charming community, spectacular surroundings. We experienced a few small problems with the apartment, all quickly and cheerfully addressed by the property manager. Major pluses include garage, balcony, and two king-sized beds. Very limited shopping in Erchie in the off season, so having a car is a must. But you are located in the heart of the Amalfi coast, with easy access to Cetara, Ravello, Minori, Amalfi, Portofino, etc. "We stayed in apartment at 08.2013. The apartment is beautiful, spacious, comfortable, clean, very well equipped. Location is very good, close to the beach - 5-7 minutes and close to the main road. The garage is very useful, because the parking is expensive. I regret only one thing - that we were there for only one week!" Great stay at the Erchie! "I have often spent this holidays at the Residence of Rosalia. I testify that this is the best apartment on the coast of Amalfi. Very conveniently located. From Salerno train station is only 30 minutes by bus. You can ride along the coast and to make visits to the town of Amalfi, Positano, Minori, Sorrento. The apartment itself is very spacious and bright, two bedrooms, kitchen, living room, balcony with sea view. What more could you ask for? This year, we easily got to Pompeii and Paestum, a lot of swimming, catamarans and kayaks." "We really enjoyed our stay in this lovely apartment with the stunning views! We were so glad we chose to stay in Erchie and not one of the bigger places on the coast. Our son loved snorkelling and swimming from the beach and buying bread and salami for us each day at the village shop. We went to Pompeii and Herculaneum and Paestum and to the Cilento, and on our last day went up Vesuvius. We also had a lovely meal one night at the 'Convent' restaurant in Cetara. This immaculately clean apartment delivered all that was promised -- quiet village, engaging water view, secure garage. The linens were immaculate, the beds very comfortable. Late March was chilly; we were glad we could turn on the heat. "Having spent five days in Residence Rosalia gave us the best vacation ever. Splendid view to the Tirrenian sea on one side, and onto the city of Erchie and to the mountains on the other, really comfortable and clean apartment, ideal distance from Napoli, Pompei-Herculaneum, and the towns of the Amalfi coast, but most of all the welcoming host, Pino assured us that this place would be revisited frequently by us in the future. The only bad feeling was that we had to leave Erchie and Residence Rosalia behind, for sure, temporarily." - By train: Salerno train station (about 8 KM). - By car coming from Naples: take the highway Napoli-Pompei-Salerno. Exit the highway in Vietri sul Mare and, from there, take the Amalfi Coast road. Drive carefully now because this road is a just a sequence of narrow curves. After about 4 Km you pass through the town of Cetara and after 2 more Km you will find the intersection to Erchie. In Erchie you will find the authenticity of a coastal little village with its peculiar way of life and the delicious cuisine, the vicinity to cultural and historical sites (Pompeii, Ercolano and Paestum) and finally the main beach and the many little beaches hidden along the coast. Erchie is so small a village that you will not find it on most maps. So I think I need to say something about this charming little village. 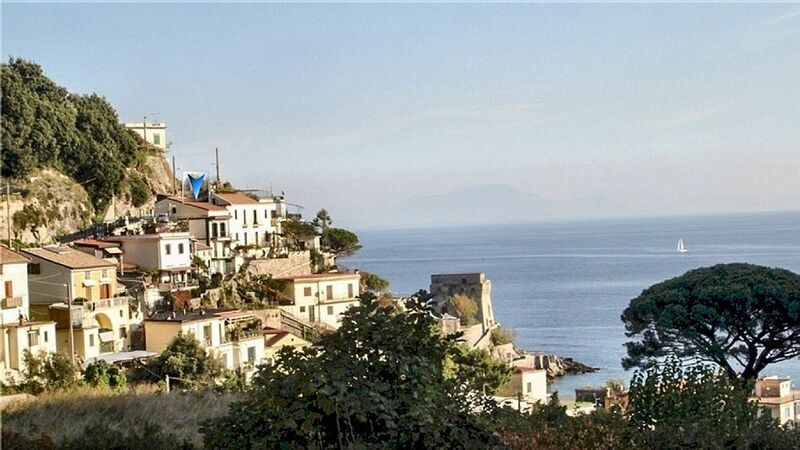 With a few hundreds inhabitants, mostly fishermen, Erchie is a romantic and quiet village on the Amalfi Coast. The heart of the village is the main beach which is surrounded by rocky slopes covered with luxuriant vegetation dispersed with little white houses. Many exclusive beaches and coves where to bathe, dive or take the sun, are hidden along the coast and can be reached only by boat. Erchie is a place where you feel you have stepped back 100 years in time, where you walk three times slower and rush nowhere. Be prepared to embrace ‘il dolce far niente’, the sweetness of doing nothing. Forget your projects and deadlines. And escape to Erchie. But, I’m sure, you will not want to miss the Amalfi Coast international jet-set holiday resorts. Beloved by artists from everywhere, with their enchanting views, shopping and strolls by the sea, Sorrento, Amalfi, Positano and Ravello are only few kilometres away from Erchie. Capri, the island of the dreams, with its incomparable beauty, can be reached in less than one hour by hydrofoil from the Amalfi harbour. Pompeii and Paestum are less than one hour drive away. A visit to this world famous locations is a must. Erchie is located at the centre of them all.